Summary: Trump appears to be preparing to expand our involvement in the Syrian war, responding to another dubious story with little evidence about a chemical weapon attack by the Syrian government. We believe what we are told, so our leaders find these wars both easy to start and useful. By Craig Murray at his website, 9 April 2018. Trump on 3 April 2018. But with Trump, what he says one week has no connection with what he does the next week.
. Those that question the narrative are declared outcasts, if not traitors. WaPo: “Nerve gas used in Syria attack, leaving victims ‘foaming at the mouth,’ evidence suggests.” Deep in the article we learn that there is little real evidence. Press release from the Organisation for the Prohibition of Chemical Weapons: “OPCW Will Deploy Fact-Finding Mission to Douma, Syria.” It is better than Wonderland: sentence first, evidence afterwards! Articles by rogue journalist Caitlin Johnstone. Tucker Carlson speaks out on Fox against war in Syria. Craig Murray is an author, broadcaster and human rights activist. He joined the British Foreign and Commonwealth Office in 1984. His career culminated as British Ambassador to Uzbekistan 2002 to 2004. It ended when he criticized regime as repressive and using torture (both the American and British governments freaked out). Afterwards he was Rector of the University of Dundee from 2007 to 2010. In 2016 the US government refused to allow him entry to the US. See his articles at his website. See his bio. See his Wikipedia entry –he has led an extraordinary life. Murray is flat out wrong when he suggests there’s no point in using gas. He perhaps ought to read up on house to house fighting at Arnhem or Stalingrad. More recently, experiences of American soldiers clearing Vietcong tunnel systems. It’s painful, slow and casualties are *always* high. Unless you’re prepared to use a weapon that’s a natural game changer. Like gas. So look at it that way. The Syrian troops have done all they can prior to assaulting the area, rockets, bombs, mortars but they really don’t want to go house to house though basements that have survived *years* of bombardment, where the enemy is clearly well dug in and in the mood to fight. So they try and deal with them by using gas that’ll sink into basements and other refuges and kill them or force them out. Who cares about civilians? Assad and his commanders have already shown they don’t. They know it works because they’ve done it before, and they think they’ll have no comeback because Russia has their back and will veto any independent investigation. After they crossed Obama’s world famous Red Line absolutely nothing happened except harsh words and empty threats. Which isn’t to say that I think that firing several hundred cruise missiles is going to do much to alter the course of things one way or the other, or that I think the west have handled things in any way other than badly. You are missing the point. Totally, which is odd since he explains it quite clearly. Did you read the post? He is speaking strategically, not tactically. That seems like he’s saying the Syrians wouldn’t have done it because they didn’t need to do it from a *tactical* perspective. Which is flawed IMO. From the strategic perspective, Syria has nothing to lose, certainly not the backing of Russia. They correctly believe that the US and allies have no appetite for an extended conflict. Therefore there will be no consequences strategically. Thought I’d covered that too. I doubt you can find any actual military expert who agrees with your interpretation. 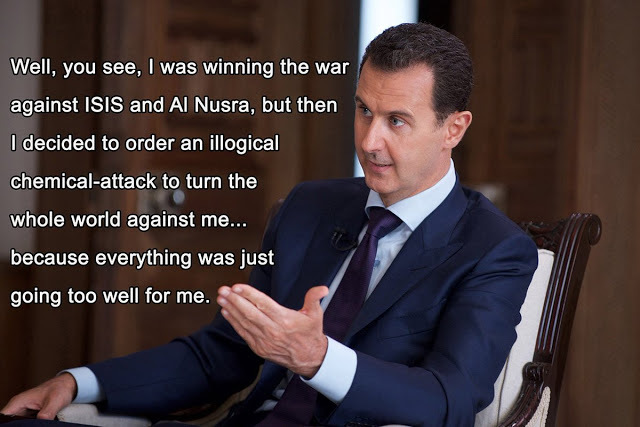 But is is typical of the fanciful justifications for the Syrian-govt-attack theory. Too bizarre to reply to. Read the news. If the gassing(s) were so successful (In order to justify continued use) hows come absolutely zero men in arms were among the victims. What, a bunch of elderly men, women and children were that tough to flush out of the neighborhood? Leave aside Murray’s credibility or whether chemicals were in fact used. Unlike him I think they almost certainly were. The case for staying well clear has nothing to do with whether chemicals were used. The question is what interests of the US or the West are served by military intervention, and whether the risk reward ratio favors it. Whether indeed it would achieve anything at all. It doesn’t. Its another case of doing something very risky which will have little or no effect on the supposed problem. We should get out and stay out. The question is, how do we stop our leaders from doing more and more of this madness. Wish I knew. Leave aside Murray’s credibility or whether chemicals were in fact used.. The case for staying well clear has nothing to do with whether chemicals were used. The question is what interests of the US or the West are served by military intervention, and whether the risk reward ratio favors it. Oddly, pretty much everybody disagrees with you. The case for intervention now is as retaliation for the Syrian govt’s use of chemical weapons. Larry, of course I realize that everyone is citing the use of chemicals to justify intervention. What I was saying was, this is wrong. Regardless of whether there was chemical use, there is still no case for intervention even if there was. Its pretty much irrelevant. Because, even if there was, the intervention is not going to solve anything, and its hugely risky, and has no rational justification. Of course if there was not, we should even more get out of there. As it happens I think there was chemical use. But I still think either way intervention is stupid, and that we should get the hell out of there. That’s clear. Thank you for explaining. Two problems with that. First, the relevant question is “by whom?” Knowledge that chemicals were used provides little or no policy guidance. The second problem is larger. I’m always amazed that people have firm convictions about matters with such flimsy evidence. As in the comments about Russia’s hit on Sergei Skripal (most of which have been disproven by news since then). For centuries educated people read the newspaper with skepticism, from Jonathan Swift in 1700 to Sherlock Holmes in 1900. Now Americans read the news as it it came from Heaven, believing that they can use it to clearly see the world. There are better ways of dealing with the problem. Work on indicting President Bashar Assad as an international criminal for violating international law against the use of chemical weapons. The International Criminal Court can issue the indictment and try him on the charges. I would recommend indicting President Vladimir Putin of Russia on the same charges. Here is the address to request the indictment: otp.informationdesk@icc-cpi.int Be certain to ask for a reply to your email request. You must know that there is not the slightest evidence of the Syrian government’s involvement, and less than zero evidence of Putin’s involvement. Also, our forces in Iraq and Afghanistan have stepped over the war crimes line many times. I doubt we want to open that can of worms. I detect a traces of sarcasm, though of course it’s impossible to tell for sure if sarcasm was used and, if Steven R. Edelman was in fact the real perpetrator. I often wonder about the intent of comments, but as policy address them as serious unless obviously meant as satire or humor. The range of opinions here is too large to make easy assumptions about them. The GOP is the stupid party; the Democrats are the evil party. Whenever they work together, they do something stupid and evil. This is bipartisanship – Samuel Francis. This is bipartisanship at work. The fact that they’re trying to get us into another pointless war suggests our society is under a lot more stress than is immediately obvious. Are our elites aware of some impending disaster that we are not aware of? It has that snazzy parallelism, breakfast cereal box wisdom that we love. Quite appropriate for a far-right wacko. Francis said that in 1993, and it was already long since proven false. The GOP is the part of the 1%, and they have grown in power and success steadily for generations. The GOP is powerful or dominant at all levels of government, in most of the three branches. Deregulation, cutting taxes, eroding away the safety net, increasing the power of the security services. Calling that level of victory “stupid” is quite daft. We see this blinkered thinking today. Journalists write countless articles every day about the antics of Clown Trump, ignoring the steady progress of the GOP in the agencies, the courts, and Congress. Who is stupid? It is interesting to reflect back on a time when the GOP was, in “popular” circles, being written off for dead, due to that “demographic thing”. I guess they(the GOP) didn’t get the memo. Now it’s the Dems on life support( at least until the next election, maybe). Sure the journalists are stupidly complicit, but then they’re only doing what they’re paid to do, what sells. The bigger problem is the masses who stupidly believe (and continue to read )what the journalists write without doing any sort of due-diligence in the least. How does one fix that? Answer: You don’t. Vietnam, Iraq and up next Syria/Iran(maybe NK). This country’s citizenry doesn’t learn squat from history and seems to get more ignorant on foreign affairs by the day. Left, right, center, upper class, middle class, lower class, doesn’t seem to matter. A hopeless case. And it isn’t like the information ( factual ) isn’t out there to be easily found(here and elsewhere). Just one example, when Saddam was gassing the Kurds, he had CIA help in doing so. Hell, even NPR put out the story. If that alone doesn’t show how utterly hypocritical and self-serving this whole business with Syria does, nothing will. But the apologists for this country, like automatons, relegate that bit of Americana to ancient history. We’re screwed, but nothing like the rest of the world due to our government’s actions and our citizen’s inactions. The GOP is quite dead in California. Republicans are outnumbered 2:1 by Democrats in the state legislature when, in my lifetime, it was a red state. Through immigration, it was turned into a blue state. The GOP is stupid because they cared only about whether their business sponsors were getting cheap labor and not whether they would continue to have voters who would vote them into office. This seems to be repeating in CO and TX and NC. The GOP has admittedly advanced its national and foreign policies even if it is at the expense of its voters. In a way, I guess you can say they’re smart. They also seem to find ways of pumping money into the MIC which is just a form of welfare for their constituents that can’t really compete with the Dems’ direct welfare. IDK how Carlson hasn’t been eliminated by the Deep State. First, that is missing the key point. US parties have always had regional strongholds. Looking at one and declaring the GOP dead — while it dominates the nation at all levels — is odd. Second, that is quite false. Republicans hold about 1/3 of the elected offices in California. That’s a strong minority in the US, more than the minority party has in many States. Yes, just like the Democrats. See how African Americans have done in the big cities controlled by Democrats. Or in California, with its high poverty rate and brutally racist police. But the Dems love the Deep State, foreign wars, and Wall Street. Just like the GOP. Bipartisanship! First, those two clauses are quite unrelated. Second, that bizarrely false. Very few major political reforms have been made in US history without bipartisan support. Such as the great civil rights laws of the 1960s (eg, here). I neither know nor care who used the nerve gas, or if nerve gas was ever used at all. I don’t think we need to be in Syria and I couldn’t explain what we hope to accomplish if you put a gun to my head. With all due respect, I’m not sure you’re deploying your best argument here. The best reason to stay out of this is that it’s not our fight, that nothing good for us will come out of it, that we really can’t fix this particular [DELETED]hole country, and that about all we’re going to manage to do here is waste blood and treasure and get some good Americans killed while making things worse. Having said all of that, whenever I see an international human rights activist from the International Association of Do Gooders, or the International House Of Pancakes or whatever explaining to me about the actual motives of some Middle Eastern butcher (And to be fair to the Chinless Dentist, they’re all butchers over there), or maundering about how this or that outrage was really a false flag, I immediately assume that I’m dealing with a loon. I suggest re-reading the post, more slowly this time. That’s not its subject. After all, neither you nor I will be consulted. The subject is stated in the summary: “We believe what we are told, so our leaders find these wars both easy to start and useful.” So long as that remains so, then we cannot govern ourselves. We will remain sheep. That’s a wonderful example of why we cannot see the world. It’s repeated every day in the comments here, and a billion times elsewhere. First an American sees the team of the speaker, and on that basis decides it his or her words are correct. Tribal truths rule. That makes us a gift to our rulers, so easy to manipulate. Try, just for fun, taking off the blinders and evaluating the facts and logic of his words. I’ll bet that’s how many in the world see US Presidents. The average US President since 9/11 has had killed more people than the average “Middle Easter butcher” in a lifetime. Plus, for fun count all the elected governments the US has overthrown since 1900 — often violently. By the way, many of those ME butchers are our allies, often remaining in power due to your tax dollars. Treat them with respect! Check your hands. US officials have spilled a lot of blood. They were elected on the basis of elections in each of which you had a vote. (4) Yet here i see a contradiction. If we were never consulted, are we still collectively responsible for a decision we never made? The people upon whom the bombs fall probably think so. That’s an important point. Perhaps the most important point. This is a Republic. It is ours and we are responsible for its actions. That’s the meaning of self-government. We do not become innocent by abdicating our responsibility. Elections are still held, which makes us responsible for those we send to DC. To use a poor analogy, if I take my hands off the wheel of the car — I am still responsible for the damage it causes. No blood on MY hands; I voted for the guy who doesn’t even know where Aleppo is. A citizen’s responsibility neither starts nor ends with voting. I was disturbed that the young teens I taught in Scouts didn’t know this. I’m always amazed that so many adult Americans don’t realize this. On a deeper level, there is the other meaning of “responsibility.” Collective responsibility. You will suffer the same fate as the rest of us. How you vote earns you no special favors from fate. This way we can escalate w/o directly hitting their nuke facilities and Vlad gets no say in the matter. All the countries that matter will be pleased. If the Ayatollahs respond, all the better for the Master Plan. Real men don’t want to go to Damascus, they want to go to Tehran. These weapons are easily made by Syria’s factories, or by insurgent groups. They need not have come from another nation. The actions attributed to the United States in this post are simply those of any imperial state trying to keep the great game going with all those pesky client states and those damn barbarians hanging out on the periphery. All run by and for the oligarchs and plutocrats. Everybody from young ZucK out in Silicon Valley to old man Buffet in Omaha. To good ole Rod Rosenstein making sure the Ministry of Justice is watching over us all from his perch in the bowels of the Imperial Capital.